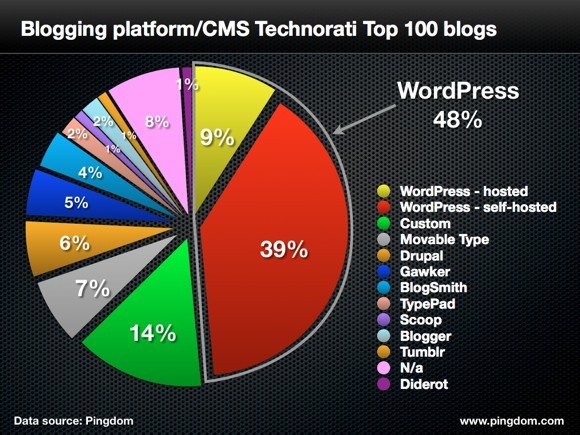 WordPress rules as the king of the blogging platforms and content management systems! It’s the “most popular and fastest growing publishing platform on the web” confirms CrunchBase. In case you aren’t aware, there is WordPress.com which is hosted and WordPress.org which is self-hosted. You definitely want to be self-hosting your website using WordPress.org. It’s so easy to publish and update your content. (If you can use MS Word, you can use WordPress.) The dashboard and visual editor are very intuitive. Your blog can be integrated into your site plus it’s the best blogging solution with an advanced CMS (Content Management System). There’s no need to learn HTML or code. In those days you had to master many skills, like making your own pastry. Remember your mother or granny kneading the ingredients? Today you can buy ready-made pastry. A white sauce was cleverly created from just the right amount of butter, flour and milk over just the right amount of heat. Chips came from potatoes, not a frozen packet. Very few people make their own white sauce, chips or pastry today, we buy these foods pre-packaged to save time and to make our lives easier. That’s similar to WordPress, many of the ingredients that make up the functionality of this powerful system come pre-packaged in the form of themes, widgets, plugins to save you time and to make your online life easier. And WordPress updates bring more cool and time-saving features – like the couple of clicks to create the menu for your navigation bar or being able to re-size your images. You don’t need to be a master cook or webmaster to run a WordPress website. The free open source, vast worldwide community powering WordPress continually improves the software making it more secure, adding more functionality and coolness. You’ll never be charged when you reach a certain size, it gives you access to its code and this massive open community project will continue to grow. Search Engine Optimization is such a buzz word and rightly so – it’s vital that your website is found online. Many have tried to outsmart Google’s algorithms and Google keeps adding checks to stop the gaming of their system of selecting which posts or pages reach the top of the search. There are multiple good strategies to improve your ranking in the search. One of the best practices is to post relevant and engaging content for your target market regularly. WordPress makes this very easy to do in many ways. You can update your website from any computer, anywhere in the world. Multiple users can work on your site simultaneously though not on the same post or page. You have complete control of your website. As a business owner this is critically important. Thanks to the ingenuity of many developers, it is very easy to integrate your Social Media with your WordPress website and spread your marketing message further than was ever possible previously. Plus engage and interact with your visitors, prospects, customers and clients. There’s a thriving community of WordPress developers creating themes, free or premium (paid for) which can be customized to enhance your branding. Your website is now your business center. Plugins make your website work for you. The plugins, free or premium, add extensive functionality to your site. (There’s a plugin for that!) From increasing your SEO (Search Engine Optimization), to adding security features, to adding audio, a poll, to making it simple to create slideshows or photo galleries, shopping carts, forums, maps, and more. WordPress adheres to all the Web Standards and keeps your website Internet compliant. Do you use WordPress for your site? Love to hear your comments or questions.